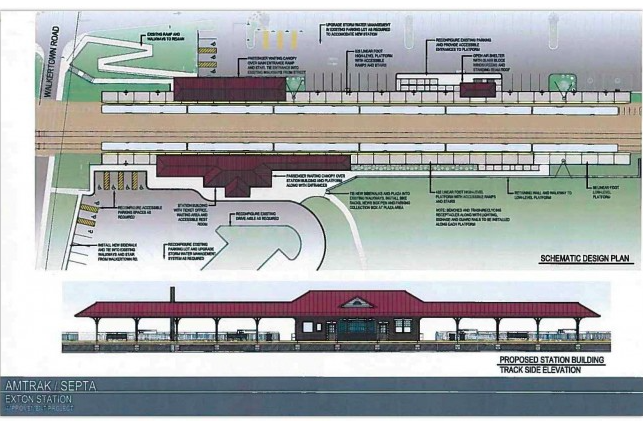 The Exton Train Station is slated to receive a ticket office, waiting area and restrooms as part of a renovation project expected to be completed in December 2017. Construction on the Exton Train Station is slated to commence this summer, state Sen. Andy Dinniman, D-Chester County, announced last week. Parking expansion and site work will begin in July, kick-starting a two-year renovation project that will add a ticket office, waiting area and restrooms to the station. The project also includes improved sidewalks, bike racks, expanded parking and new, raised platforms to make the train accessible to people with disabilities. Bidding opens Friday. Construction is expected to be completed by December 2017. Construction was accelerated due to a federal judge's ruling on an American With Disabilities Act lawsuit, according to Dinniman. Other issues also must be resolved.